If you ask Bob Pacios about his childhood, he’ll start by telling you that he was born “at an early age,” in Medford Massachusetts on August 24th, 1924. His mother, an immigrant from Belgium, and his father, a World War I veteran, worked hard to provide for their six children during the depression; his mother found work ironing shirts, and his father went through several layoffs before establishing a laundry business of his own. 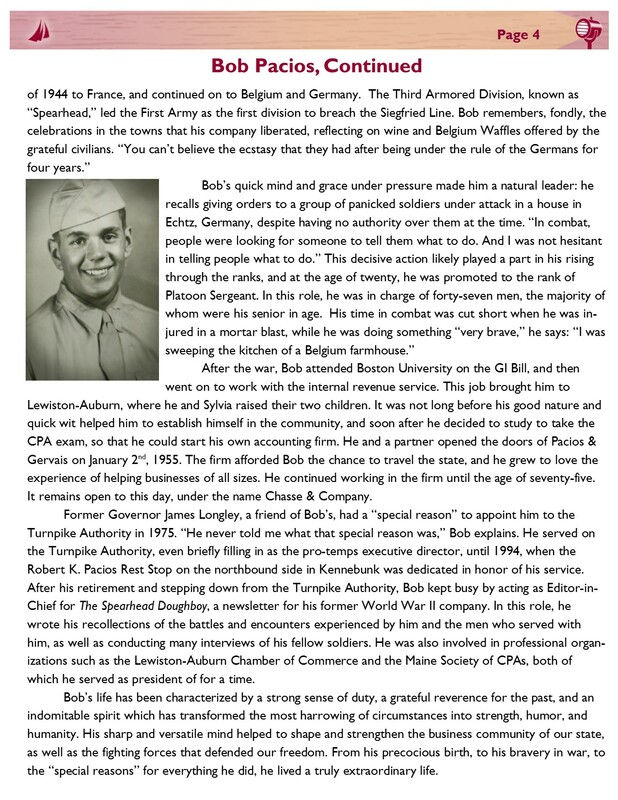 After the war, Bob attended Boston University on the GI Bill, and then went on to work with the internal revenue service. This job brought him to Lewiston-Auburn, where he and Sylvia raised their two children. It was not long before his good nature and quick wit helped him to establish himself in the community, and soon after he decided to study to take the CPA exam, so that he could start his own accounting firm. He and a partner opened the doors of Pacios & Gervais on January 2nd, 1955. The firm afforded Bob the chance to travel the state, and he grew to love the experience of helping businesses of all sizes. He continued working in the firm until the age of seventy-five. It remains open to this day, under the name Chasse & Company. Former Governor James Longley, a friend of Bob’s, had a “special reason” to appoint him to the Turnpike Authority in 1975. “He never told me what that special reason was,” Bob explains. He served on the Turnpike Authority, even briefly filling in as the pro-temps executive director, until 1994, when the Robert K. Pacios Rest Stop on the northbound side in Kennebunk was dedicated in honor of his service. 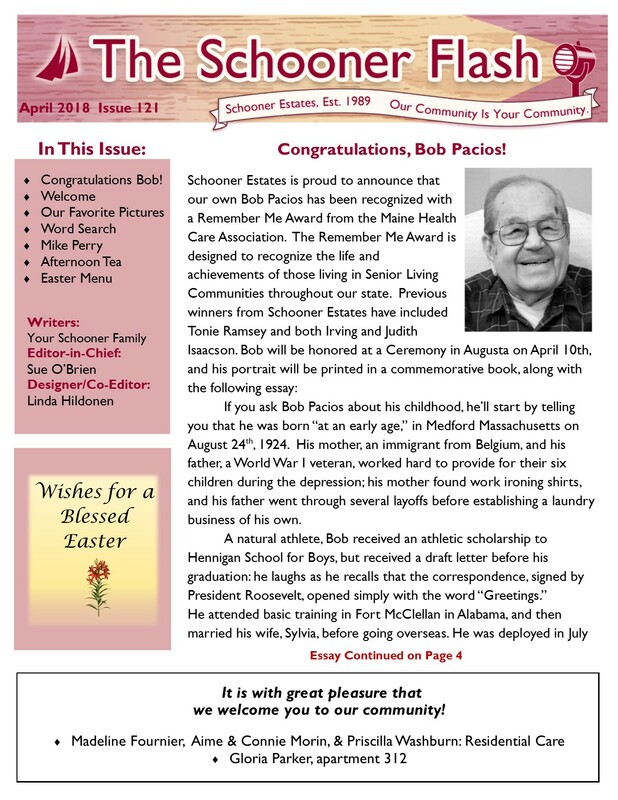 After his retirement and stepping down from the Turnpike Authority, Bob kept busy by acting as Editor-in-Chief for The Spearhead Doughboy, a newsletter for his former World War II company. In this role, he wrote his recollections of the battles and encounters experienced by him and the men who served with him, as well as conducting many interviews of his fellow soldiers. He was also involved in professional organizations such as the Lewiston-Auburn Chamber of Commerce and the Maine Society of CPAs, both of which he served as president of for a time. Bob’s life has been characterized by a strong sense of duty, a grateful reverence for the past, and an indomitable spirit which has transformed the most harrowing of circumstances into strength, humor, and humanity. His sharp and versatile mind helped to shape and strengthen the business community of our state, as well as the fighting forces that defended our freedom. From his precocious birth, to his bravery in war, to the “special reasons” for everything he did, he lived a truly extraordinary life. Join Freeport, Maine’s Michael Perry for a scenic slide show journey down the coast of southwestern Maine from Kittery to Portland. Mr. Perry’s shows are always popular and a favorite here at Schooner. 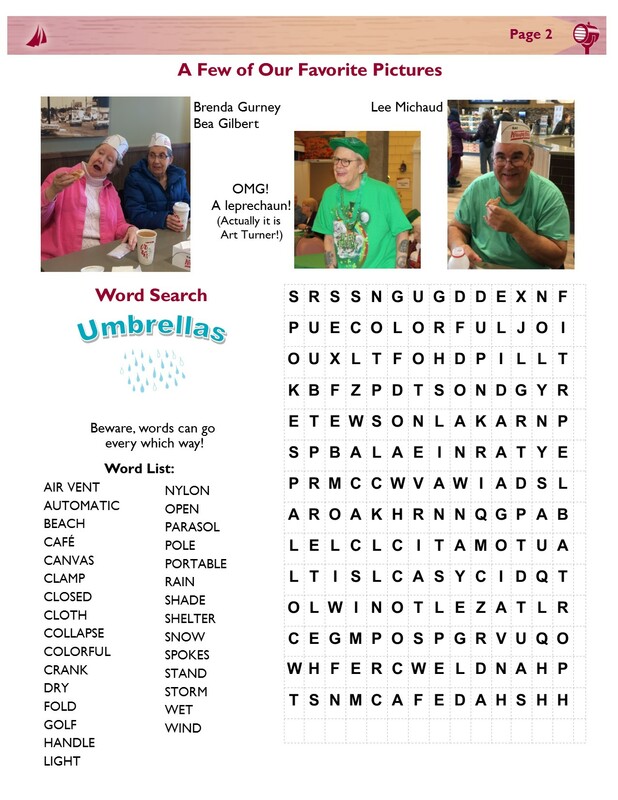 He is looking forward to seeing you all on Tuesday, April 3rd at 2:30 p.m. in our Tenants Harbor Room. His presentation, “Exploring Maine’s Seaside Beauty: Kittery to Portland,” will explore along far-reaching sandy beaches, peak into secluded coves, and check out lobster eateries in Kittery Point, Perkins Cove, and Wells. Historic inns and homes dot the route including the Lady Pepperrell House in Kittery, the Colonial Inn in Ogunquit, the Wedding Cake House in Kennebunk, and Portland’s Victoria Mansion. The classic stone churches of St Peter’s By the Sea in Ogunquit and St Ann’s in Kennebunkport, and the historic Spurwink Church in Cape Elizabeth offer quiet reflection and beauty. From Fort McClary in Kittery, Nubble Light in York and Cape Elizabeth Lighthouse you will enjoy scenic vistas out over the ocean blue. Maine features 3500 miles of coastline; some of the most inspiring of those miles are right here in our own backyard! Pretty pictures, fun sea stories, and fascinating local trivia all geared to bring back fond weekend getaway and vacation memories. So let’s start out the month of April with a fine show by Michael Perry. Happy Spring to everyone! 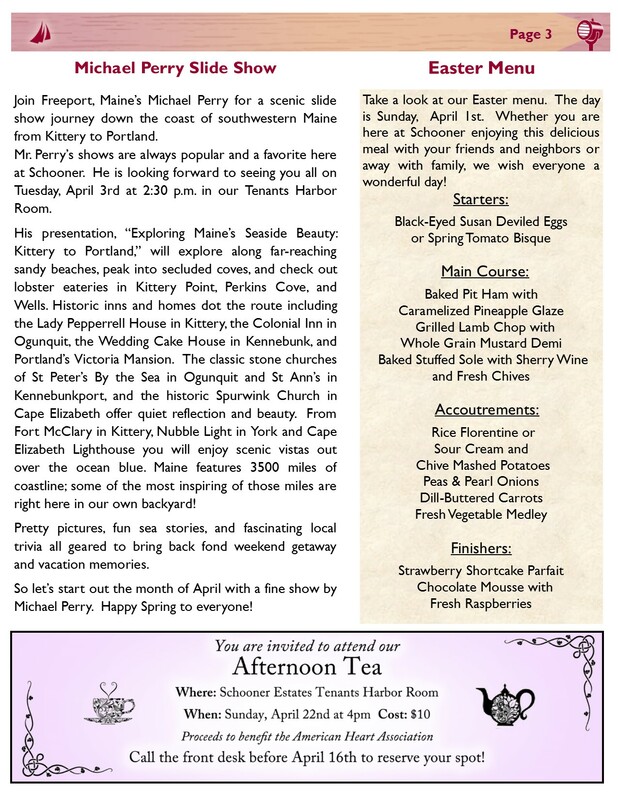 Take a look at our Easter menu. The day is Sunday, April 1st. Whether you are here at Schooner enjoying this delicious meal with your friends and neighbors or away with family, we wish everyone a wonderful day!